According to the owner, the boat is in good condition and systems work as designed No stains or excessive wear on carpets and seating. Her exterior upholstery is new in the last season. This boat is in very good condition for a boat this age. 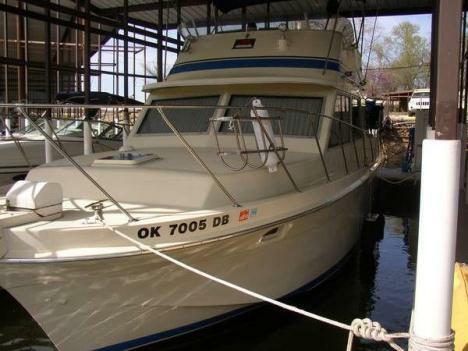 Stock #168715 1986 CARVER 3207 AFT CABIN MOTORYACHT TWIN CRUSADER'S If you are in the market for an aft cabin, look no further than this 1986 Carver 3207 Aft cabin, priced right at $28,900 (offers encouraged). 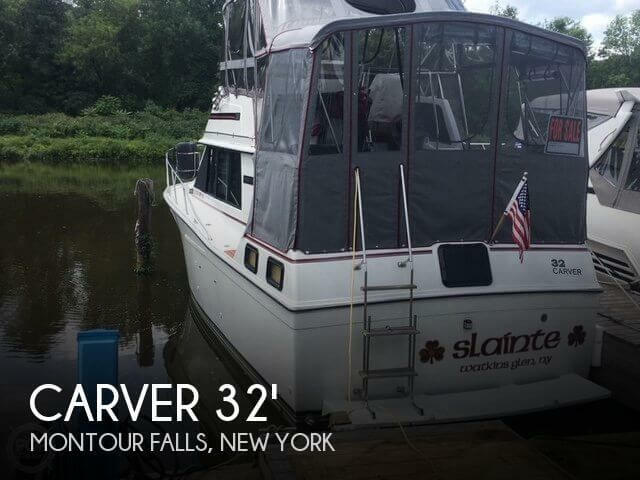 This vessel is located in Montour Falls, New York and is in good condition. She is also equipped with twin Crusader engines that have 1,350 hours. Reason for selling is not using. This Sea Ray is in good condition. The right rear corner has some minor fiberglass damage that should be an easy repair. The refrigerator has been replaced and works well, as does the microwave and water heater. Stock #130936 . 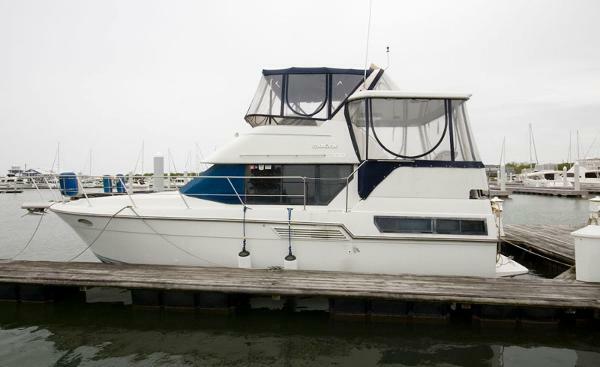 Twin 350 Mercruiser Engines, Bimini, Dual Controls, Sliding Glass Doors, Teak Deck, Diving Deck, Sleeps 8, Galley, Shower, Living If you are in the market for an aft cabin, look no further than this 1979 Sea Ray 300 Sedan Bridge, just reduced to $20,750 (offers encouraged). 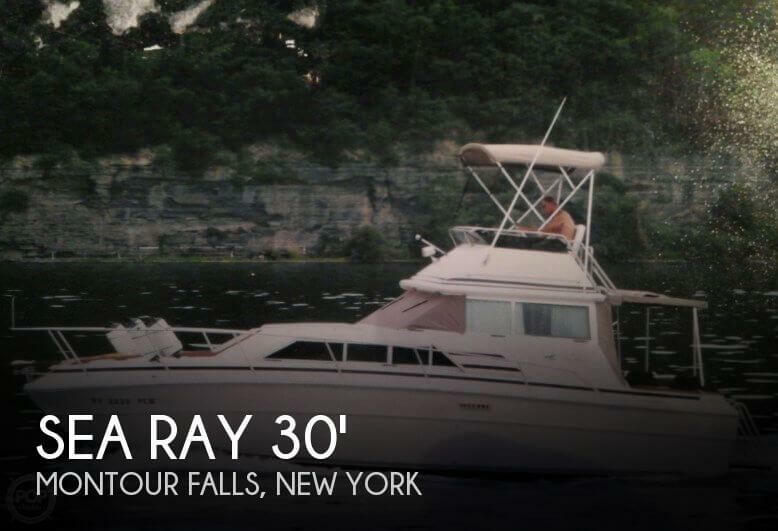 This boat is located in Montour Falls, New York and is in good condition. She is also equipped with twin Mercruiser engines. Reason for selling is no time to use. 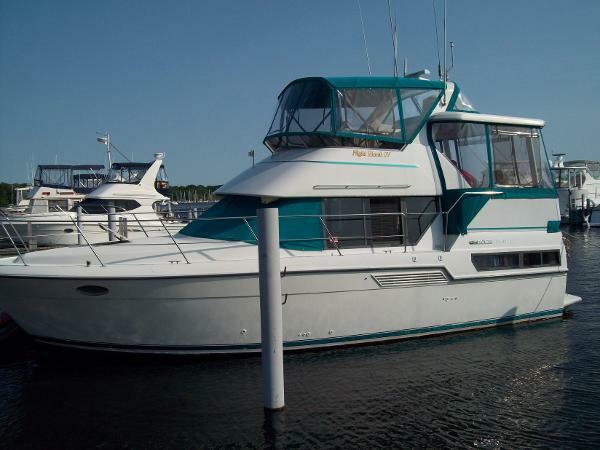 1994 Carver 350 Aft Cabin Twin 454 XL Crusader engines (approx 800 hrs), 8 KW Generator, dual air and heat units, two bathrooms w /vacu-flush toilets, separate shower in rear stateroom head, full size fridge, 3 burner stove and oven, enclosed aft deck with hard top, wet bar and ice maker. This boat has a rare factory installed spiral staircase to the swim platform and bunk beds in the forward cabin. This boat is well cared for and shows very well. 1986 Carver 350 Aft Cabin Getting on towards 80 its time for new owners to have the fun of a lifetime we've had on Puffin, our 36 foot, aft cabin Carver. Though 30 years old, she is still in showroom condition, with her roomy aft cabin, large wood trimmed salon, spcious dinette and galley, and breezy upper helm and cruise area. We have cruised her easily some 3000 miles from Michigan, through the Trent Severn and Erie canals, and down the Intracoastal to Flroida. Always runs smoothly, plenty of power when needed, simple to dock, and cozy for overnights with family or friends. Many upgrades like chart plotter and new port windows, solid maintenance like new cutlass bearings and regular oil changes, and extras like docking lines, dinghy, life vests and fenders so she is ready to go for new owners. 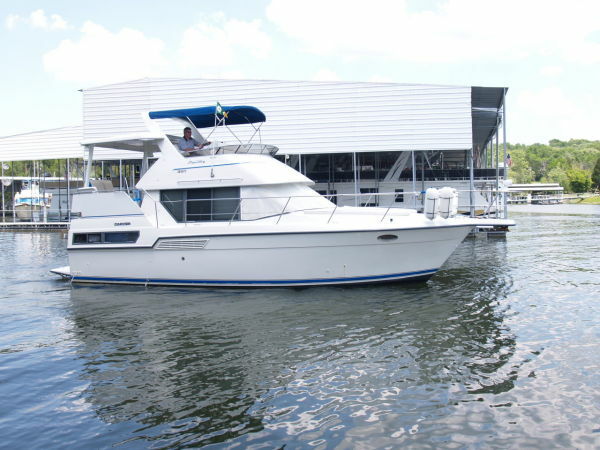 If you are thinking of a family boat for cruising, this spacious and airy older queen is the way to go. 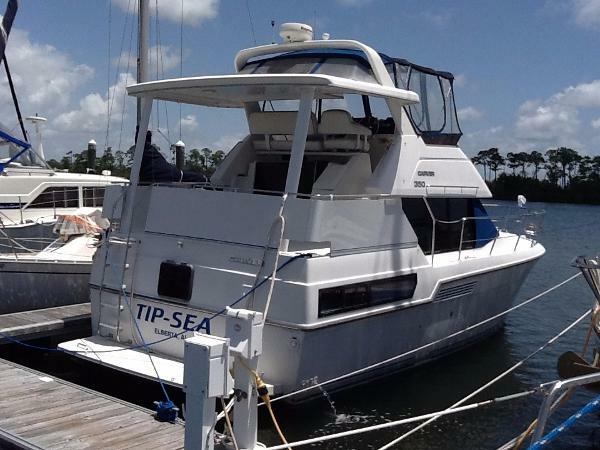 Call Dennis Dodge at Advantage Yachts 772 597 0707, 772 284 2628. 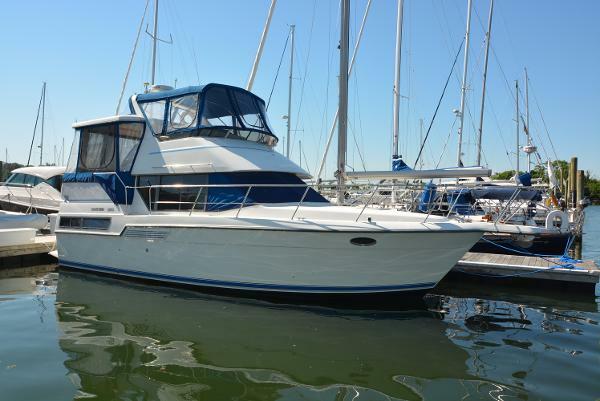 1993 Carver 350 Aft Cabin This classic cruising vessel is clean inside and out. Well appointed and ready for the open water. Twin powerful 454 Crusaders give it the ability to move rapidly and cruise efficiently when not in a hurry. 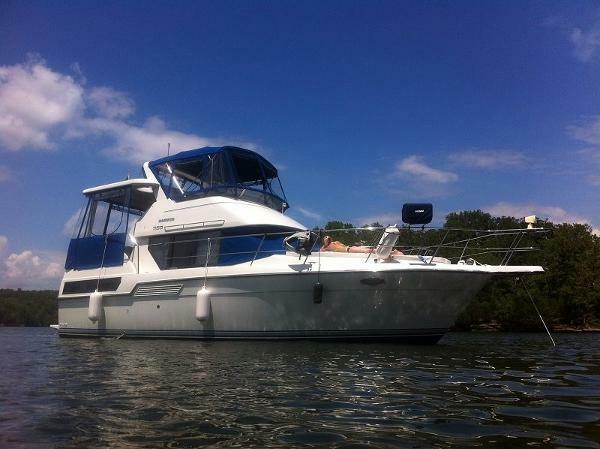 1993 Carver 350 Aft Cabin THIS 350 MUST BE SOLD. LOOKING FOR OFFERS THIS WEEK. NEW BOTTOM JOB AND GOING INTO THE WATER THE END OF JULY.The Carver 350 started a great run for Carver with the 350,355,356 which kept other brands chasing the popular layout. With 2 staterooms and 2 heads the boat feels more like a 40 footer. Merc 7.4's and a Kohler generator provide the power.CLICK FULL SPECS TO SEE THE PICS AND DETAILS. Bottom freshly painted July 2016. SELLER WANTS OFFERS.  1994 Carver 350 Aft Cabin Nice Carver 350 Aft Cabin, Updated 315 hp Yanmars in 2002, Kohler 8KW generator, Full canvas enclosure. 1994 Carver 350 Aft Cabin If your in the market for a Impeccably clean boat to accommodate the whole family then this is the boat for you. The 350 (later called the 355 and then the 356) Aft Cabin offers two staterooms, two heads, open galley, large salon and spacious aft deck making it the perfect boat for enjoying your time on the water. "LOW HOURS, AIR/HEAT, GENERATOR & EXTREMELY NICE" Call to see this Meticulously maintained 350 Carver today! 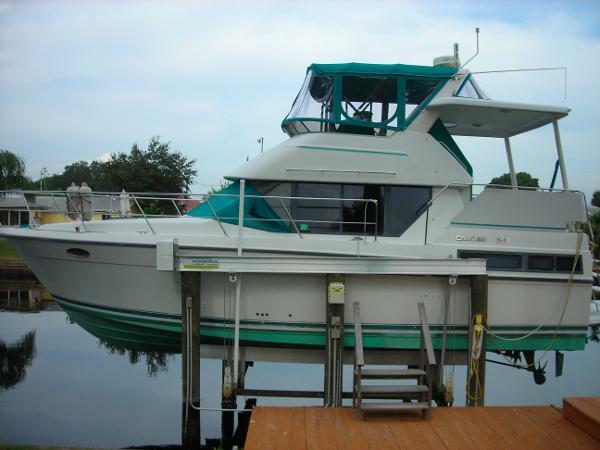 1994 Carver 350 Aft Cabin "Summer Condo" is a spacious, well-maintained vessel, with plenty of upgrades. The boat has all new canvas and isinglass, a fresh buff and wax, and the interior has been completely updated with new soft goods. 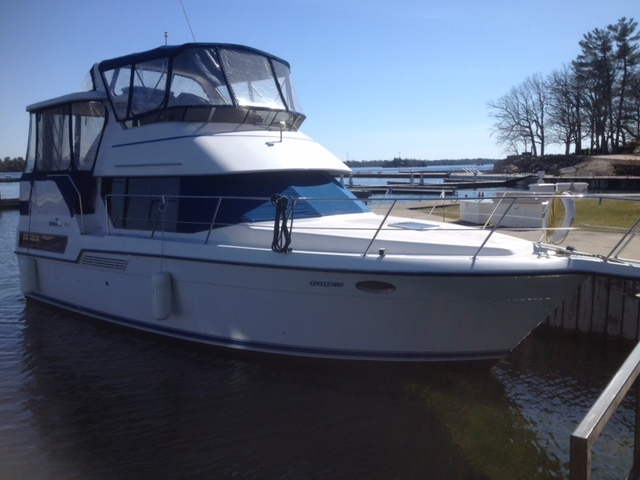 1993 Carver 350 Aft Cabin NEW LISTING ADDITIONAL DETAILS & PHOTOS COMING SOON.